From Abstracted to Abstraction. What's in a term? "What is Abstract Art? The term 'abstract' has negative connotations. In common language it means to remove, to take away. In this sense all art is abstract to some degree." "Since the Gothic, European sculpture had become overgrown with moss, weeds - all sorts of surface excrescences which completely concealed shape. It has been Brancusi's special mission to get rid of this overgrowth, and to make us more shape-concsious. . . Because a work does not aim at reproducing natural appearances, it is not, therefore, an escape from life - but may be a penetration into reality . . . "
I was meeting with an artist and art historian the other day and he brought up the question of abstraction. "If you look at the history of abstraction," he started, "it really is about a lack of reference to the external world." This seems simple enough, right? Well, we started looking at a number of paintings, and, after much debate, realized that we couldn't entirely agree on what constitutes abstraction. How "external-world-like" must something be before it becomes figurative? And what, for that matter, is the nature of the "external world"? Many prominent scholars, in particular writing in the United States, from Clement Greenberg to Benjamin Buchloh, have taken a hard-lined stance on abstraction, relegating much work that contains trace elements of figuration to the dust-bin of traditional art (or, at least, disqualifying it from the hallowed halls of the avant-garde). Buchloh in fact sets up the monochrome - that most abstract of abstract painting - as the telos of avant-garde practice. But, at the time that such work was being made, any clear delineation of the "abstract" was up for grabs. In 1947, the newly founded magazine Das Kunstwerk published a double edition with the title "A Small Glossary of Abstract Painting," which defined abstraction as "anti naturalist," encompassing everything form Cubism and Futurism to Expressionism and Surrealism (!). "Abstract," in other words, was nothing other than a synonym for "Modern." Works like this Surrealist painting by Wolfgang Paalen, by this definition, would be abstract. The narrative title tells us we are witnessing a fight between Satrunine Princes, which appear to be floating in the sky. The sinewy muscles of an other-wordly torso are rendered using light and shade; and the spikes, tendrils and loose-floating hairs on these imaginary creatures are well known here on earth. These beings may not exist in our world, but they could exist in some possible world. Is this work abstract? Later on in his career, Paalen even more towards abstraction in such works as Beatrice Perdue, in which the surrealist strategy of automatism plays out on the painting's surface, leaving marks of improvisation. How would we describe this type of abstract painting? The MOMA exhibition catalogue puts forth five loose categories of abstract art, none of which is entirely satisfactory: Pure Geometric, Architectural and Mechanical Geometric, Naturalistic Geometric, Expressionistic Geometric, Expressionistic Biomorphic. Today, we see tromp l'oeil abstraction (Ben Weiner), bodily abstraction (Carl Ostendarp), faces abstracted to geometric forms and then graffitied around (Luke Rudolf). 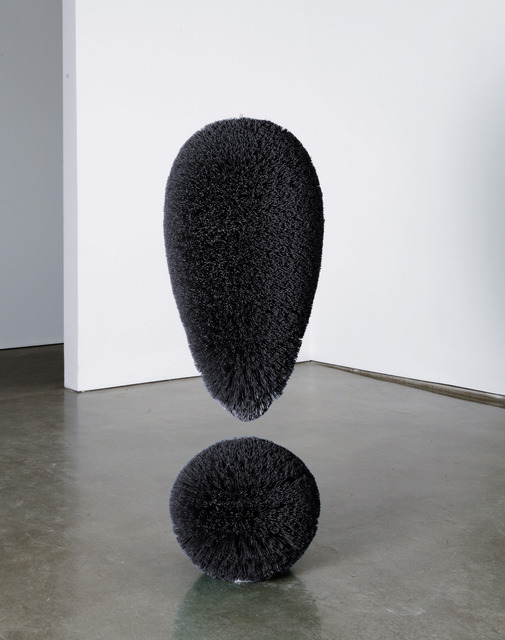 Is punctuation (Artschwager) abstract? Diving into old sources has shed light on ways to think about the abstraction of today, and concepts like "abstract versus figurative" or "undifferentiated abstraction" are a step in the right direction, but clearly there is still much work to be done on the vocabulary of abstraction. Martin Damus. Kunst in der BRD 1945-1990. Funktionen der Kunst in einer demokratisch verfassten Gesellschaft.Hamburg: Rowohlt Taschenbuch Verlag GmbH, 1995: 8. "Kleines Lexikon abstrakter Malerei." Das Kunstwerk, Vol. 2 (1946): 32.